An intriguing inscription on a Batley cemetery headstone led me to discover the story behind Lottie Oddy and her fiancé James Purdy. Born in around 1892 Charlotte Emma Oddy, known as Lottie, was the daughter of butcher George Henry Oddy and his wife Emma (neé Popplewell). They lived at Staincliffe Road, Dewsbury. Lottie worked as a sewing machinist making blouses at Carrbrooke Manufacturing Co. She left her employers during the war to take over the book keeping and clerical duties at Oddy and Fox rag merchants based at Common Road, Staincliffe. This change was caused by the absence of her brother, Spedding. A partner in the firm, he was away serving in as a despatch rider in the Royal Tank Corps. Lottie’s fiancé, James Purdy was born on 13 August 1890. He was one of four sons of Batley Carr residents Walter and Susanna Purdy (nee Raspin). James’ father worked as a foreman rag grinder at Messers Thomas Purdy and Sons, a mungo and shoddy manufacturer located on Bradford Road, Batley Carr. Initially James also worked in the rag and shoddy warehouse but he found manual labour a struggle due to his delicate health. He therefore established his own rag merchants business in around 1913 which, according to newspapers, was flourishing. His delicate health meant he was exempt from military service, although this was due for review in January 1919. The sweethearts were from the nonconformist tradition. James was connected with the Batley Carr Primitive Methodist Chapel; Lottie with the Staincliffe Wesleyan Church. Described as a devoted couple, they had known each other for a number of years and, according to some newspapers, had been engaged for about five or six. On 7 September 1918 they joined Lottie’s widowed mother and her sister, Gertie, for a two week holiday to Bridlington. The Oddy family were frequent visitors to the town, holidaying in the resort for several years. On the afternoon of Friday 13 September Lottie and James went out for a walk but promised to join Gertie and some friends later that afternoon on the sea front. They failed to turn up. There then followed a frantic search involving police from Bridlington and Batley Carr, the harbour master, boatmen and friends and family of the couple, including James’ father who travelled to Bridlington to assist. Their mysterious disappearance was covered nationwide. They had no known worries; their engagement had family approval; they did not boat, and indeed investigations had found no craft missing; their baggage remained in their Horsforth Avenue apartments; and they normally stayed around the area of the sea front, occasionally walking towards Flamborough. An accident was always recognised as a distinct possibility. Fears of a landslide due to the recent wet weather formed one suggested line of investigation. But even this direction had proved fruitless. They had in effect vanished without trace from a busy seaside town. The hope remained that they would turn up alive and well, although James’ father did say that he felt as though his son was calling to him for help. Police issued their descriptions. 5’2” Lottie was brown-haired, blue-eyed, fresh complexioned and of robust appearance. When she left her apartment she wore a gold and brown woollen sports coat, grey mixture frieze skirt, white blouse, black stockings, black shoes, black felt hat and a raincoat. She carried a black moiré bag and had a diamond ring. She also left the apartments with a book. James stood at 5’1”. Of medium build, he had a slight stoop, a pale complexion and was clean-shaven with rich brown hair. He wore a grey suit, black tie with a gold pin in it, brown mackintosh, light cap and black boots. He had a gold signet ring on his left hand. No sign of the couple could be found and their disappearance remained a mystery until Saturday 21 September. First thing that morning a retired farmer, Arthur Mason, took a stroll along the South Sands. It was a route he walked regularly. Over recent days he had noticed a cliff fall. The day before his latest walk the sea had been rough with a higher tide than in previous days, reaching right up to the cliffs. Mr Mason noticed it had washed away part of the clay from the fall, exposing a man’s blood-covered head and shoulders. He immediately notified the authorities. Soldiers and police extracted the couple’s bodies from the clay in which they were entombed. The inquest later that day concluded Lottie and James had been sitting beneath the cliff on James’ coat, when 10-12 tons of overhanging clay broke free and fell on them. James apparently heard something and was in the process of getting up in an effort to protect his fiancée. He had his hand outstretched towards Lottie. She had been sitting on the coat reading her book. Her right hand reached out towards James, and beside her left hand was the open book. This was Alice and Claude Askew’s “The Tocsin: A Romance of the Great War”. This stretch of beach had been the scene of a previous accident in September 1904, when a Bridlington Grammar School junior master and pupil died as the result of a cliff fall whilst out fossil hunting. A noticeboard erected warning people about the danger of sitting under the cliffs had been washed away several years ago and never replaced. The Coroner, Mr Herbert Brown, recorded a verdict of accidental death due to a fall of the cliff. This caused the suffocation of Lottie and James. He said he would call the authorities about the necessity of erecting warning signs. James’ funeral took place on 24 September and Lottie’s the following day. They are buried in family graves in separate areas of Batley cemetery. Ironically at the beginning of October 1918 the papers reported yet another Bridlington cliff tragedy, with the death of 22 year old Bradford woman Ethel Keal. She fell over the cliffs at Sewerby. One report indicates an eight year engagement. 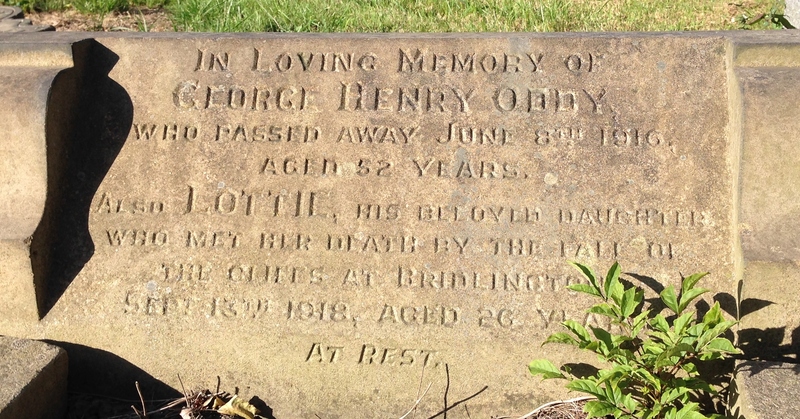 Lottie’s father, George, died in 1916. Alice and Claude Askew were extremely popular husband and wife authors. Associated with the Serbian Campaign, the couple drowned in October 1917 when the boat they were sailing in from Italy to Corfu sank following German submarine torpedo attack. Mr A Graham Allen and Jack Broomhead. Another pupil, Joseph Baker, escaped.